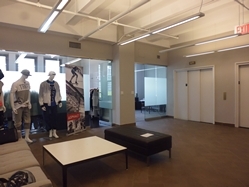 Midtown East Showroom Space for Rent | Madison Ave - Call for Price / 3000 SF. 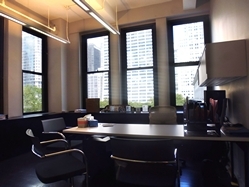 Incredible space with wide open flexible creative layout; the following commercial loft office overlooks Bryant Park in Midtown Manhattan. 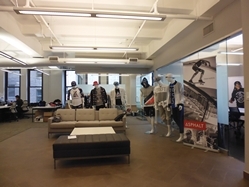 Today the unit was being used as a Showroom space for an apparel designer. The corner unit as it stands has been configured into an open layout (as seen in the photography above) - with direct eleveator entry onto the space itself. Between the high ceilings and the wall of windows coupled by the high floorplate - this loft enjoys an airy bright atosmosphere. 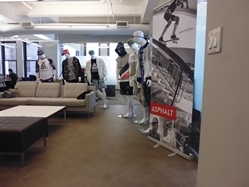 The commercial space contains high beamed ceilings, some exposed ductwork, glass partitions, and finished flooring - with both carpetted & polished hardwood sections. This office comes pre-built with two windowed private offices, some open work space, and a recently renovated conference room. 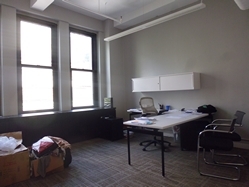 The office space comes with private bathrooms and pantry area. 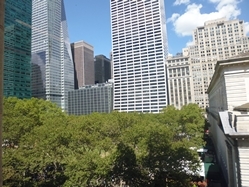 This building overlooks Bryant Park and stands as an architectural marvel with a gorgeous lobby. It is one of the best locations in midtown and has great views all year round. 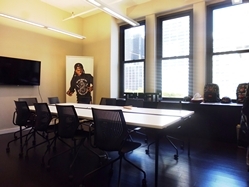 It is conveniently located near Grand Central Station, and the 4,5,6 subway lines. Today - new building wide renovations have been implemented including a new lobby, high-speed elevators, and refurbishment of the hallways / common areas throughout. 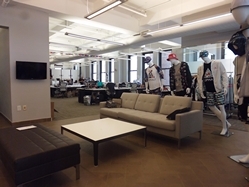 In total this availably offers you an inspiring loft space great for any fashion, media, tech, artist or any other creative professional as well as any business looking for an exciting loft space! via MTA Transit Hub; 4, 5, 6, 7 and S (shuttle between Grand Central and Times Square).